This is Kodak my 4 year old long haired german shepherd. Yes he is wearing a life jacket and yes he knows how to swim :) The jacket is just so he can enjoy the water with me and not rush to retrieve his toy and get out. Kodak loves floating in the creek and being able to hang out with everyone. His favorite thing in the whole world (aside from me ha ha) is his tennis ball. He will do anything for one. Kodak is a true GSD. He is very protective over me but only if he has a reason. Also, he loves people especially little kids, he wants one of those as a pet ha ha. It works both ways, I do anything to make him happy as he does any and everything to make me happy. This breed of dog is truly special and I am very lucky to be owned by a GSD! Thanks so much for taking the time to let us know all about your wonderful German Shepherd Dog, Kodak. I do love those long coated German Shepherds too - in fact I've owned several of them! They are so pretty. 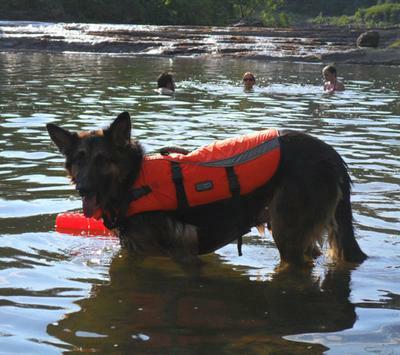 I have had several German Shepherds that were water lovers too. In fact Cera, my matriarch from years ago, would have lived in the water if I could have let her I believe. I think she was practically amphibious! And She could swim like Michael Phelps! And I have had several other German Shepherd Dogs since then that loved to play in the pools, water puddles - you name it. So it can be very common in some GSDs to be "water hounds"! I hope you guys have a long and happy life together. And if you ever have the chance and want to share more pictures and stories of Kodak with us, please do so. We'd love to see how he's doing. Continued success - German Shepherds rule! First, let me say what a Handsome boy you have!! You said it Best, what German Shepherd are all about! Mia my Beautiful Shepherd just turned 3 years old and she is the same way; loves her all kinds of balls,socks and shoes too! She is always at our side and loves people and her little cousins! German Shepherds are so Protective, Loyal, Faithful and Trustworthy. It doesn't matter if they are female or male, they are the Same inside and out. The only thing different between your Kodak and my Mia he loves the water, I wished she did. Take care of your boy and he will always take care of you! German Shepherd - Top Dog!! !